I’ve been writing for nearly six years now and I’ve always had issues calling myself and Author or Writer. What right do I have to call myself that. I’ve not been traditionally published so that means I’m just playing at it. Of course my confidence grew the more my books sold and I got recognition, but deep down, I was still insecure. Then something clicked this week. I was invited to Selby Library for a local author event and there I met to other Self Published Authors called David Baker and Colin Eston. Just talking to them I came to realise that I am not alone in making the mistakes I’ve have. I also learned that feeling insecure is perfectly normal. There were lessons learned and I was able to pass on my own advice and tips. Later that evening, I sat back and thought about it and realised this is what I do. I AM an author in my own right. My books sell and I have a readership. So my new job title is Deborah. C.Foulkes Writer. 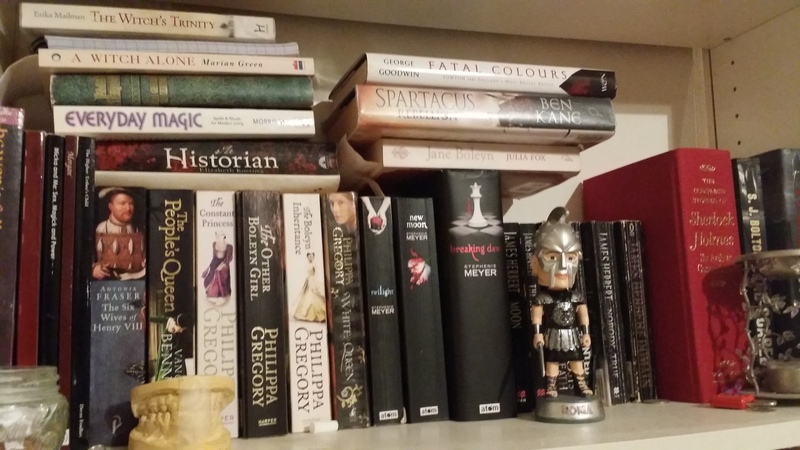 This morning I got a message that I’d been tagged by the wonderful author Derek Birks to show my Writer Shelfie. So, due to a mass decoration and switch around, I admit I had to tidy said shelf in order for public viewing and here it is. So taking Derek’s lead, I am going to share what’s on my shelf. I’ll start with the non books, which may leave you scratching your head. The first thing is my Russell Crowe/Maximus. I bought this for my dad while in Rome, because he was such a big fan of the film. When he died, my brothers decided it should come back to me and he guards my literature. Now for the teeth. Yes they are teeth. My daughter’s to be exact. During her teeth being remodelled with wires etc. This is the impression of the final product and should her retainer break, we have this as a mould. It is a bit gross, but I enjoy people looking at it puzzled. Now for the books. I have a few copies of my own books, but with them is what I call my Tudor collection ranging from Philippa Gregory to Anthea Fraser. I love Alison Weir too, but she is not on this shelf. These books helped create the seed to develop The Boleyn Effect. During Uni, I did a practise Dissertation on the media representation of Henry VIII. Yes a little was an excuse to watch The Tudors, but mainly, at that point, I believed I would do my main study on the Tudors. I used Weir and Fraser as part of my basis on Henry’s character as well as Anne Boleyn and so created Henry Cobain and Leigh-Anne Boorman. I also have some old books of one of my heroes James Herbert. Many of them are old editions and very well read. When I was around ten years old, I started rifling through my mother’s bookshelves and found him and Stephen King. I discovered two men who could scare me senseless and I fell in love with the books. I do have the Twilight Saga, because I don’t mind admitting that though the films made me want to tear my eyes and hair out, the books are not that bad. I enjoyed them for what they were, the films just ruined everything. Then there is my birthday gift from my best friend Astrid. I love Sherlock Holmes and so she bought me this special red hardback edition that is unread. There is also my witchy books. I am a witch. Not a Wiccan, but a witch. The meaning for me personally is that I try and live my life in tune and respecting my environment, both in nature and society. I do and can cast spells, but nothing really major. Mostly potions from stuff grown in the garden for colds etc. All pretty normal and none of this dancing naked under the moond, because one: it’s damn cold and two: my neighbours don’t really need to see my body dancing around. Finally, Sharon Bolton’s books which are my favourite crime books of all time. One is signed, which is again unread. I love the way Sharon weaves a story leaving you guessing all the way through who has done it only to slap you in the face with it in the end. Music Makes the Words Flow. I know there are many writers who need to a calm atmosphere and utter silence in order to fall into the world they are creating. For me it’s different, I am very happy to write with a lot of activity around me. Silence just disturbs me and makes me jumpy. I just can’t concentrate, so I use music. I find that having a soundtrack allows me to get in the mood, whether it be a fighting or a love scene, music allows those emotions fall from my brain onto the page. I have a wide range of music taste, but what really inspires me to write is music with a lot of drama and dynamics. Classic and rock music melded into one is one of those genres that I love. Every thing I’ve ever written as its own soundtrack and some are as wide ranging as the other. But then sometimes the work chooses the music. When writing Immortal, what was the strangest was the need to play a lot of 80’s power ballads. I couldn’t understand it. Immortal is set in modern day and not even a hint of of the 80’s anywhere. I didn’t question it but carried on. Sometimes if the muse calls you’ve just got to get on with it. Whereas with The Boleyn Effect, I carefully chose the music to write to. Words with lyrics that conveyed the mood of the moment. Harry Cobain is a punk fan and listens to The Undertones, so of course Teenage Kicks was a must. However, to contrast that, Leigh is a younger woman, with different tastes and when they are in the club dancing to Usher’s Scream, those lyrics fit that moment and her. As for The Higher, I chose all classic and some rock music. I found that the epic soundtracks fitted well with the fantasy element as well as Benedictine Chants. There was a need to write to music that drove the passion inside before spilling out onto the page. So this is how I work with music and how important it is in that process. Music that drives and stimulates passion and emotions that silence could never do. Not for me anyway. So I’m going to leave you with some examples of music that I use.